On the way back, we had a brief stop in Hong Kong. Yes, there was an umbrella vending machine at the ferry station. I was amazed at that. But it wasn’t till I got home and looked closer at the photo that I discovered the machine had a TV screen, showing a video that featured those umbrellas’ benefits. 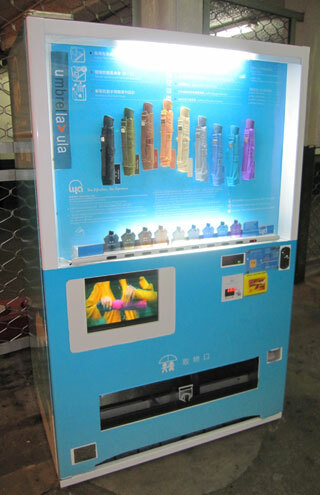 I want to visit eastern Asian just to see these ridiculous vending machines! Specifically, the warm coffee in a can. Can you choose the color you want? James: I wish I had more time in Hong Kong – but that was the only unusual machine I saw in the roughly 7 hours there. Tim: I think the buyer *could* pick the color they wanted. Genius! And a “how to” video is absolutely necessary to avoid unhappy customers who were expecting to fly…or dance like Gene Kelly.